The DVD, Move to Learn, is designed to enable a parent, teacher or helper to run the Move to Learn program with a class or an individual child. Each of the Movement Sequences is clearly demonstrated in an easy-to-follow-along-with manner and all important information is included. 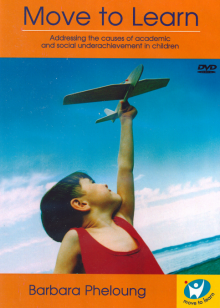 The DVD runs for approximately 50 minutes and includes information about learning difficulties as well as interviews with a doctor, occupational therapist, osteopath and behavioural optometrist. Prices are listed in Australian dollars and include GST. International customers are not required to pay Australian GST.